After a sweep in Kansas City, the Yankees have now won 5 straight to go 23-13. It's a number nobody expected at this stage with about two-thirds of the lineup on the DL. The difference between predicted an actual results has been the pitching of course. And specifically, the matter-of-fact return to form of 43-year old Mariano Rivera. Rivera announced this would be his final season after tearing his ACL in a freak batting practice accident back in Kansas City a year ago. And he does his job with the same ruthless efficiency: like Robert Patrick's character in Terminator 2. 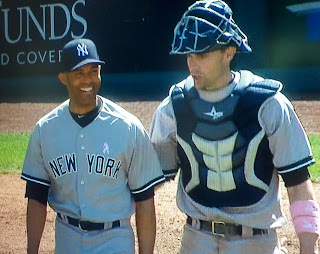 And going 15-for-15 in save opportunities in the Yankees' first 36 games deserves a smile and a break from character. To put that in perspective, Rivera has more saves than the Yankees have losses. And while Mo seems like the obvious Yankee MVP at this point, he wouldn't be in position to close without the strong starting pitching, led by Hiroki Kuroda. Each of Kuroda's starts (5-2, 2.31) has been winnable and he goes deep into games, like another 7.2 innings today. This is Kuroda's 6th season on this side of the Pacific and for 4 seasons in LA the results differed drastically from start to start, though the stats evened out by the end of each season. 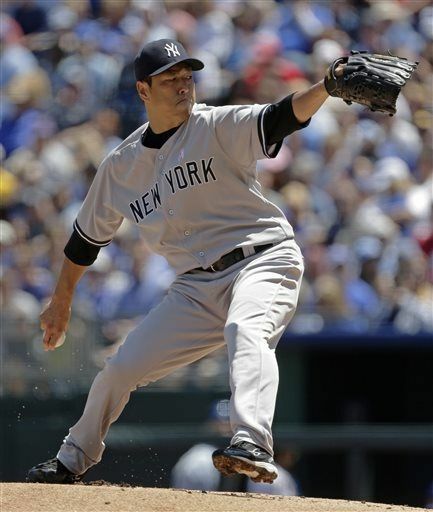 As a Yankee, his first few starts of 2012 were much of the same until he became the rotation's anchor, even better than CC Sabathia and Andy Pettitte. And there's been some fire to go with his ice. 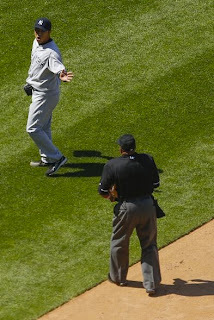 Today it was a little dust up with home plate ump Laz Diaz upon his departure in the 8th. Kuroda still uses an interpreter so you'd have to think Diaz was put off by body language. But the international language of baseball always translates: pitching.